The SharePointOrgChart web part can draw an organization chart from any relational database structure that follows these rules. Has a Parent Field -a field that identifies the parent of this row. Creating an organization chart from a database is a two stage process. Using SQL Server Management Studio create a new database table. Add a column called UniqueId setting the data type to int and set the Identity Specification of the column to true. For the best performance an index can be created on this column. Now enter data into the table. In the example shown a person called Jane has been added. As she is the head of the company her ManagerId has been left as null. The table has been populated with two additional rows of data. As both people report to Jane the value of their ManagerId has been set to the value of Jane's UniqueId. Now we are ready to configure the org chart. Create a new page called DatabaseOrgChart by selecting the Add Pages option from the Site Actions menu. Select the OrgChart web part from Custom Categories and add the web part to the page. 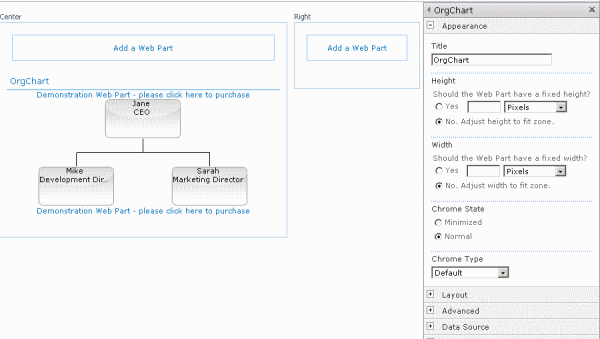 Once added the OrgChart web part requires configuring. Click the link on the web part to open the tool pane. SQL Query: This should be the SQL statment required to return the data to the web part. Finally press Apply and the configured org chart should be displayed as shown.